Today was a full hectic day for Bharatiya Janata Party leaders in Odisha as the party leaders across the state observed 'Satyagraha'. The campaign was organized in all 147 constituencies in the state to highlight the achievements of Narendra Modi government at Centre. The BJP leaders have staged peacefully at various places since they named it 'Satyagraha' on the occasion of Gandhi Jayanti - 146th birth anniversary of Mahatma Gandhi. The BJP leaders of the state participated and observed it giving full and loud signal to the state government. State BJP President K V Singhdeo said in Bhubaneswar that the BJD party failed to keep its promises made during the elections in the manifesto. 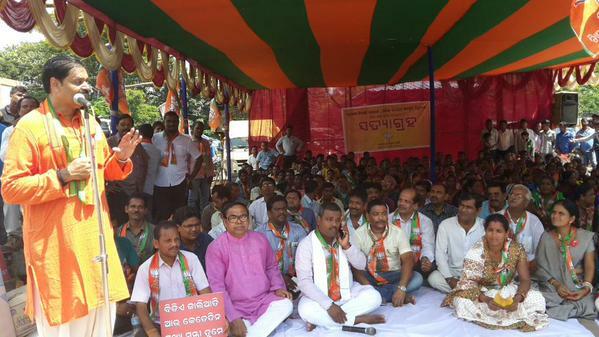 He also challenged the state government for open debate on the issues of centre's negligence to Odisha.